In order to be able to characterize the content of our video catalog, the Data Team is working on automatic algorithms to extract topics from the video. 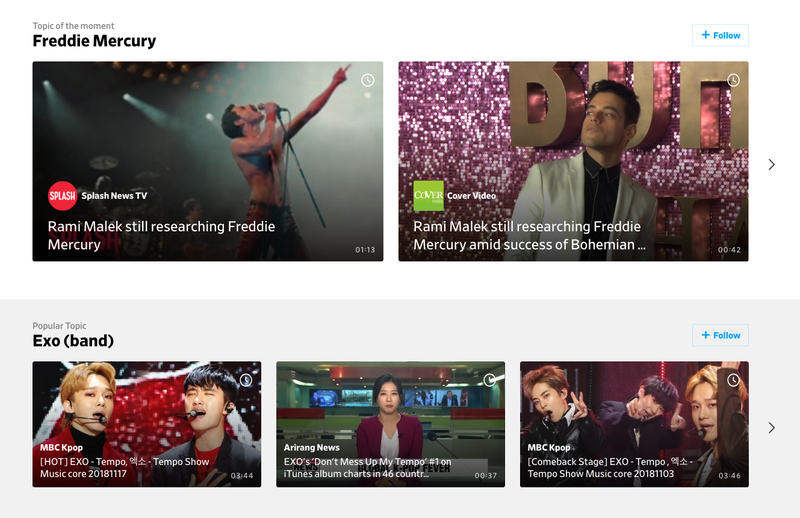 Watching interface: push videos with trending and popular topics, recommend videos related to a topic. Search engine: retrieve videos from a given topic. SEO and acquisition: increase the external visibility of our video catalog and get more new visitors. Relevance & quality of the topics: we want to have relevant and specific/precise topics. E.g : “2018 FIFA World Cup” vs “Football”. High precision/coverage tradeoff: we want to tag (or cover) the maximum videos with at least one topic and with a minimum error rate. E.g: we can have a 100% coverage with (almost) random topics vs 50% coverage with very accurate topics. Fast and up-to-date annotation: we need a fast annotation pipeline that proposes updated topics. E.g: “Juventus” for a video related to Cristiano Ronaldo vs “Real Madrid”. In this section, we will present the different steps of the actual topic annotation pipeline running at dailymotion. Let’s get a bit technical! Raw data (aka metadata): the description, the frames and the audio. In order to have a robust model, it is important to work as much as possible on (raw) metadata. Schema of the actual pipeline running at dailymotion. Each step is presented below. NB: In this post, we will focus on the pipeline running on the video descriptions only. This step takes all the metadata related to the video as input and outputs the description and the associated language. This step takes the video description and the corresponding detected language as inputs and outputs candidate topics related to the description. Our approach is different from traditional Natural Language Processing (aka NLP) tasks with semantic analysis of the text. Instead, we used a framework that maps an unordered set of words (the video description) to universal Wikidata entities (candidate topics). NB: this task is called “Named Entity Linking” (aka NEL). Example of a Wikidata entity defined by its id: “Q15869”. More details here. As usual, we first need to clean the descriptions and tokenize the words. We remove low-frequency words, one-character words, … Also, we deal with overlapping words since words may overlap or be a substring of one another, we need to detect their boundaries. Example: “jaguar cars”, we discard the token “jaguar” and keep “jaguar cars” instead. For a given word, we would like to pick the appropriate sense in case of polysemy. Then, we pick the sense with the highest disambiguation score, which is the sum of the two weighted features. 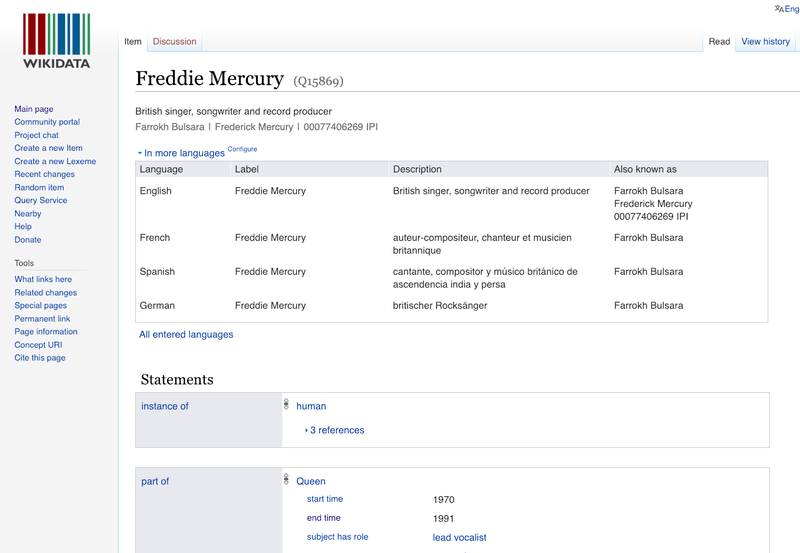 Once we have mapped each word to a unique sense (or Wikidata entity), we want to select only the meaningful entities to generate candidate topics. “Tata Motors” is very likely to be a link in Wikipedia. The (averaged) coherence of the word within the description. For each word (and its unique associated sense thanks to the disambiguation phase), we compute a coherence score with each other words and average all the score. The coherence score between two words (or senses) is also based on the overlap between their in-linking pages in Wikipedia. 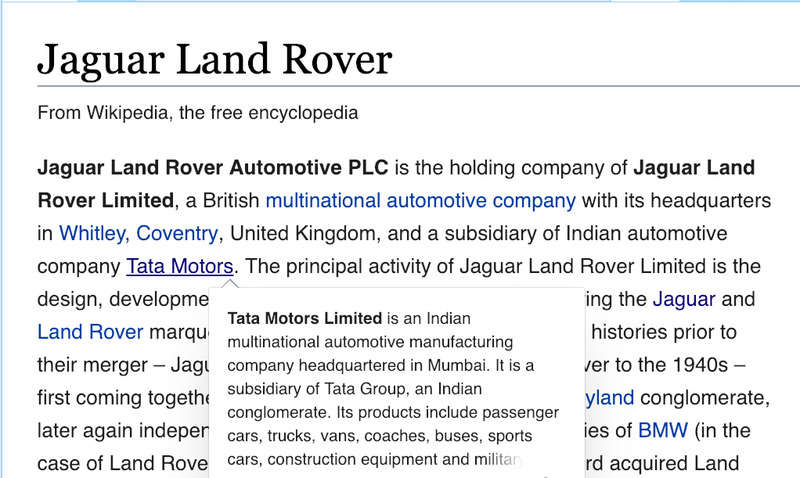 Back to our example: “Tata Motors acquisition of Jaguar”, the words “Tata Motors” and “Jaguar” are coherent between each other since both of them are car companies. This step takes a set of candidate topics as input and outputs/selects the accurate ones. The precision threshold allowed is very high (for example if we set a 99% precision for our topics). The description is ambiguous or not representative of the video (this is the case if accurate topics come from other metadata like the frames or the audio). Thus, we need to build an automatic (machine learning) model that first ranks the candidate topics and then selects the accurate ones. Our model will mimic human decision. For each candidate topics, we compute features that will help the model to decide whether the (candidate) topic is central or off. NB: a “central” candidate topic is a topic associated to a video, otherwise if it is “off”, we discard it. In addition to all the previous features (disambiguation score, averaged coherence score, …), we compute features related to the (Wikipedia) popularity of the topic, the match (occurrence and position in the description/title), the affinity between the candidate topics and the coherence with the channel (for example a candidate topic about Basketball is more likely to be central for the channel BeIN Sports than CNN…). Then, we train (or fit) a model on a subset of the training set and find the optimal hyper-parameters on the rest of the training set (aka validation set): the optimal model has learnt (complex) rules on the features that will automatically decide for a new video which candidate topics are likely to be central or off. Indeed, the estimator will output a centrality score for all candidate topics for a given video, which allows us to do the ranking. The selection allows us to push accurate topics on the dailymotion interface. For the last step, we compute a centrality threshold on the validation set above which candidate topics are considered to be central to the video. We determine it by setting a minimum precision for our topics. NB: the coverage on our video catalog is relatively close to the coverage on the validation set. 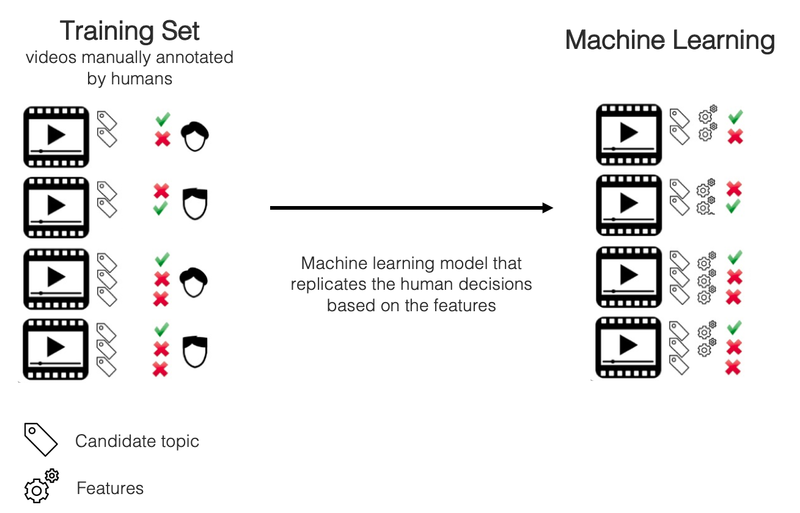 Our solution meets all the criteria for a relevant topic annotation pipeline (relevance of the topics, good precision/coverage tradeoff, up-to-date & multi-lingual annotation). Working on the frames to cover the videos with no descriptions (or incomplete ones) or to get more topics per videos. Working on the topics to build an automatic categorization of our topics (example: “2018 FIFA World Cup” < “Association Football” < “Sports”). Working on both descriptions and topics/categories to get a “contextual” categorization of our videos. Thanks to Dailymotion Engineering, Rachel Wignall, and Colas Courjal.